2007 August « SEND IT!!! This was one of the better races I’ve seen so far with the winds at a steady 25 to 28 mph going right to shore, so the markers were set close enough to shore for the fans to get into the racing action. In some scenes on this video you can hear fans cheering in the background…I was one of them :) Great to see all of my friends tearing it up out there even though I was sidelined by my knee injury. The vicarious thrill was all there. Thanks to Scuttlebutt for this blog post and sharing this video. Why are the people of Michigan not supporting their local kitesurfers the same way that Californians do? Just got pointed to this reference from a dear Michigander (is this what they call someone from Michigan?) friend, about kiters trying to stake their claim on water access. Gotta help these kitesurfers fight the good fight as this can only help improve the reputation of this already fine state. According to Roll Call, the arresting officer alleged that Craig lingered outside a restroom stall where the officer was sitting, then entered the stall next door and blocked the door with his luggage. The report alleges Craig then touched the officer’s foot with his foot and the senator “proceeded to swipe his hand under the stall divider several times,” according to Roll Call. At that point, the officer said he put his police identification down by the floor so Craig could see it and informed the senator that he was under arrest, before any sexual contact took place. In recent years, Craig’s voting record has earned him top ratings from social conservative groups such as the American Family Association, Concerned Women for America and the Family Research Council. Craig also has opposed expanding the federal hate crimes law to cover offenses motivated by anti-gay bias and, in 1996, voted against a bill that would have outlawed employment discrimination based on sexual orientation, which failed by a single vote in the Senate. We need some sort of new punishment for politicians that are so extreme in their in their hypocrisy. Here’s someone who obviously isn’t comfortable in his person, and as a result is making life very difficult for others out of his own frustrations. This guy has no right being an elected official. Noteworthy here is that he’s been helping Romney’s campaign. Here‘s the full story. BLUELITHIUM HAS LAUNCHED A NEW behaviorally targeted ad network, the first service built to help political candidates leverage the Web’s geo-, demo-, and behavioral targeting abilities to advertise their campaigns. The San Jose-based digital marketing company rolled out its Voter Network today, and politicos can run standard display, rich media, and even video ads, crafting messages with targets as specific as: Women, ages 18-34, living in Seattle, with a household income of $70K+, who are interested in foreign affairs. So what’s the concern here? Well, for one, to the extent that Blue Lithium can tell if a user clicked on an ad, they can begin to classify them further in terms of where they sit on the political spectrum based on the candidate whose message they followed. The opportunity for misuse of the information gathered through this network is also fairly substantial in an area, that unlike companies pushing unwanted offers for commercial gain, can begin to affect our political & social lives in undesired ways. Imagine such a network in a country where the ruling political party decides to start going after its opponents in nefarious ways. It will be interesting to see where the privacy advocates will come down on the value or concerns over this offering, but frankly, I think the possibility of abuse is fairly significant and something that Blue Lithium will have to answer to sooner or later. To me, this raises concerns on par with the DoubleClick/Abacus privacy issues, and more recently the Google/DoubleClick ones. Certainly a topic for a good debate. A good interview with Jim Kiriakis, a really cool guy and the brother of one of my closest kitesurfing buddies Bill. 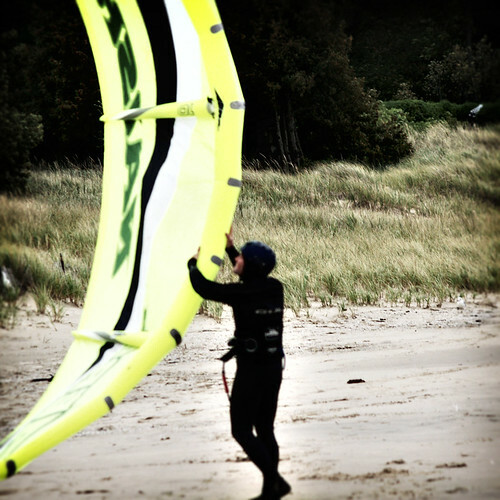 Jim has been a die-hard windsurfer while his brother slowly moved out of the sport and picked up the kitesurfing mantle in the family. Jim has been one of the producers of the events out of the St. Francis Yacht Club and talks about this past week’s windsurfing nationals. Towards the end of the video, the kiters get some respect with a clip of the boarder cross event held by another good buddy, Gabe Brown, two Saturdays ago during Crissy’s Kitesurfing week. My friend Erin took several rolls of pictures of the event which will give you a good sense of the fun time that was had by all. You can check them out on his site here (http://www.loscocco.net/images/200707bigair/).